Catering is available at this Chill-N location! Find more information here. Cool down with a Chill-N frozen treat! Pinecrest has been awarded one of the ten best places in Florida for high “quality of life.” We don’t want to toot our own horn, but we can’t help but to think that perhaps our delicious ice cream and frozen yogurt has helped! A cool chill has settled over Pinecrest, and it is fueled by liquid nitrogen! Why use liquid nitrogen? Glad you asked. When we flash-freeze ice cream, you don’t have to use ingredients that are full of preservatives and we can create a creamy, crystal-free, super-fresh treat. We are proud to offer a variety of ingredients to fit almost any dietary restriction. And, whether you come for the science, the tasty treat, or to use our wifi and air conditioning, you won’t be disappointed! When you visit our ice cream shop, you can have a bowl of fresh, made-to-order ice cream, just the way you want it, in just six steps. Pick your base — traditional ice cream or frozen yogurt, or our vegan-friendly coconut milk. Pick a flavor - pick one of the classics or try a seasonal flavor! Try our coffee flavoring, brought to you by our local Southern-Florida’s Panther Coffee! Toss in some Mix-n’s — check out the Periodic Table of Flavors for all of the options. Try the fudge and strawberry sauce, handmade fresh in our shop! Then, watch in amazement while we use liquid nitrogen to flash freeze your concoction. Prepare your spoon and taste the smoothest, creamiest, freshest ice cream — yes, we are convinced you can fall in love with your ice cream! We invite you to stop in and let us flash-freeze a unique concoction just for you! With so many options, you can visit us everyday and never have the same treat twice — we challenge you to try! 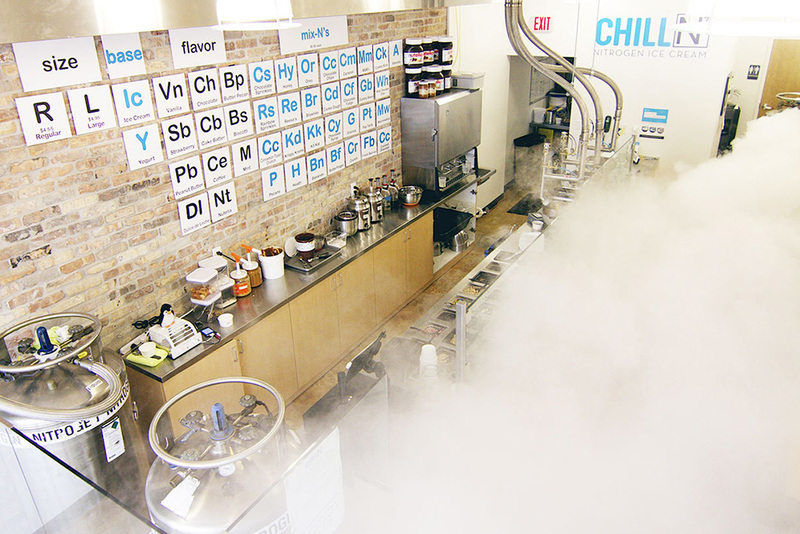 Ain’t No Party Like a Nitrogen Ice Cream Party! If you find that you love our delicious ice cream as much as we do, let us cater your part or special event. Let us help spread the joy of fresh, made-to-order, nitrogen flash-frozen ice cream to all of your friends and family!